Each track has been digitally remastered to remove hiss and buzz, but it should be made clear that many of these tracks were recorded onto cassette and reel to reel tapes so some degradation is still there. You will marvel at the bold claims made by the talkers on these tracks. 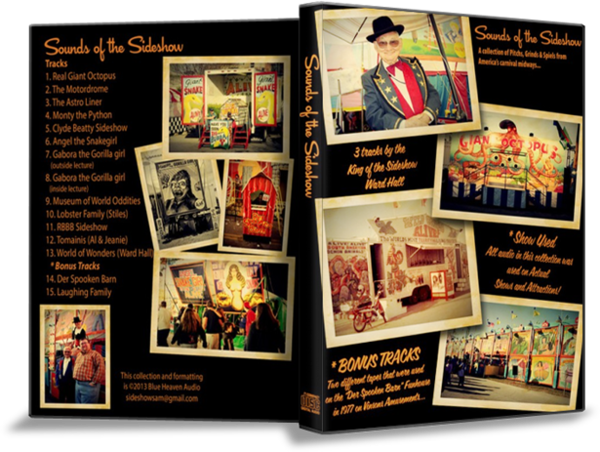 3 of the tracks are by the King of the Sideshow – Ward Hall. Liner notes inside the custom CD case will give you a history of each one of the tracks and where they came from. This disc is approximately 55 minutes in length and has no filler material – you will enjoy listening to these tracks over and over as they transport you back to a different time. Special Pricing is only 26.95 – Order your copy today!